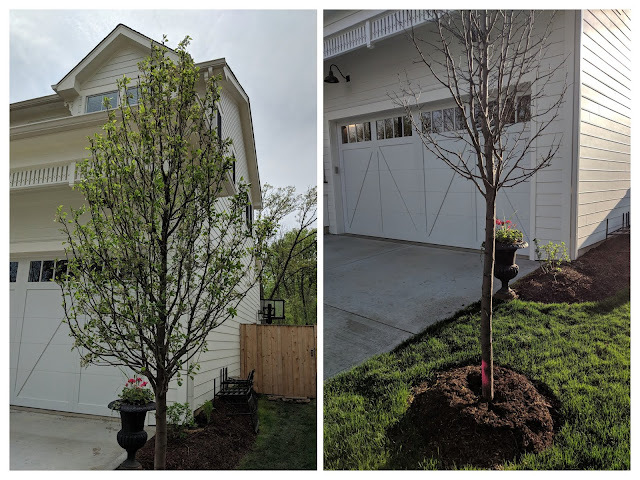 Right at the end of May, I posted about the 3" caliper Chanticleer Flowering Pear tree that we had installed right outside of our garage didn't make it through the Winter and was slated to be replaced. Welp...as you can see in the photo above, the new tree arrived and was planted recently. 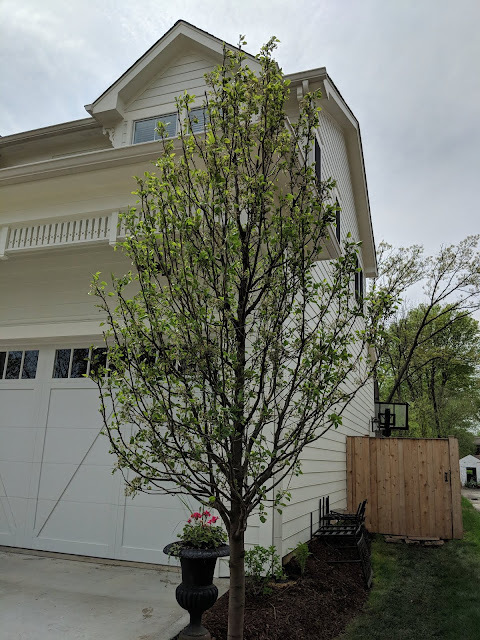 The initial tree was planted in June of 2018 before we moved in and I did a check-in post on the tree in February of this year when I speculated that the tree didn't make it based on the very few buds being set on the tree in the fall. Here's a side-by-side comparison of the new tree and the one that they ripped out. I've made no secret about my love/hate relationship with these flowering pears. They do a really great job of growing fast, providing screening and even a little show in the Spring. But, I know that they're a cheap/low-cost solution that isn't all that long-lived. That hasn't stopped me from planting three of these including this one, a medium-sized one as a screening tree and a tiny one that the Bird helped plant on Earth Day this year. I also planted a half-dozen of them at our old house in Elmhurst that have grown into pretty-good-sized specimens that I admire every time we drive by the old place. As the rear of our property started to fill in this Spring, I've started to think about planting a row of small Chanticleer Pears along the property line knowing that we have some large trees in the back currently, but over time, they'll deteriorate (I am particularly worried about this MASSIVE Oak Tree that is in the easement). If that big tree (and others) disappear, we'd have limited screening - not just from the neighbors to the West, but most importantly from the sun in the late afternoon. I figure, a row of small pears today become a good screening about 10 years from now and are a cheap 'hedge' to the bet of the large trees surviving.